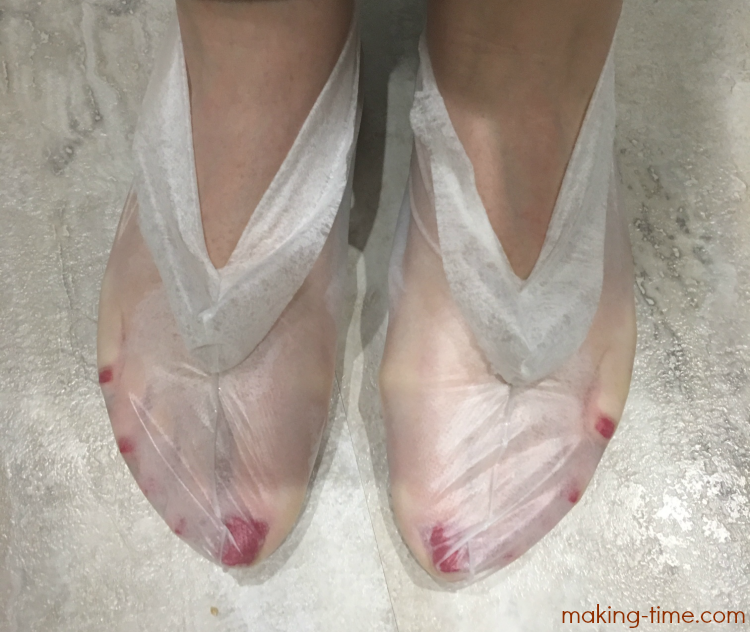 After seeing photos and a short video of women using what seems like a miracle foot mask, I knew I just had to try it out. I haven’t had a pedicure in a really long time and with sandal weather on it’s way, my feet were in need of some love. The photos and video that I saw depicted the layer of dead skin literally peeling off the bottom of the foot in large sheets. I thought to myself there’s no way this could be, so I took thing into my own hands to find out for sure. 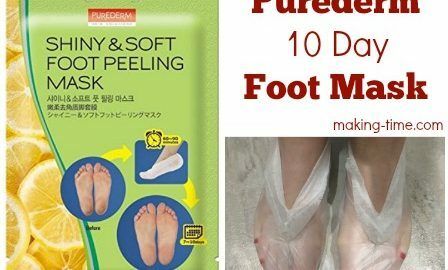 After browsing foot masks on Amazon, I decided to get the three pair pack of Purederm Shiny & Soft Foot Peeling Masks. The same day they arrived, was the same day I tried them out. I was so excited and just couldn’t wait to see if they’d really work! Application of the foot masks was really easy. You’ll see everything in the video below, but the masks are just a foot shaped bag that has a liquid-type substance inside. 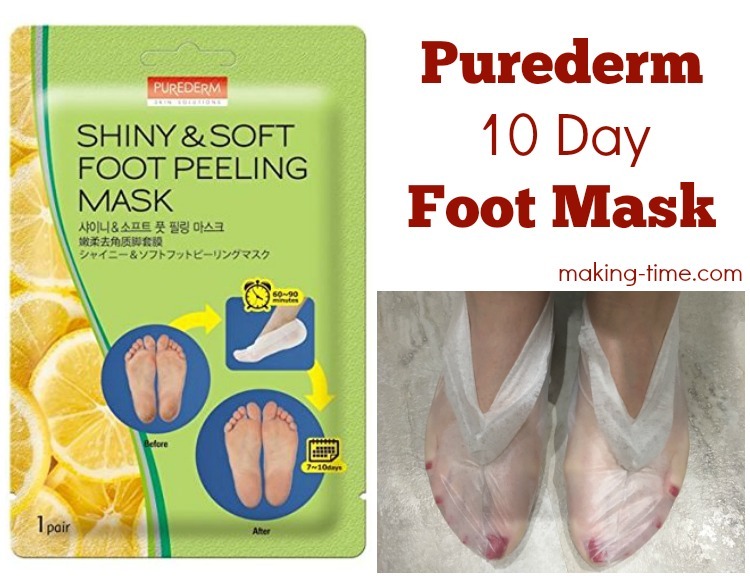 You place your foot in the mask and wear them for 60-90 minutes. I was a little concerned the foot masks would be kind of loose, but they actually fit nice and tight. For the 90 minutes I wore them I was sitting for the most part, but you’re still able to walk around if you need to. The masks aren’t uncomfortable to wear, but just a squishy feeling if you walk around. After about 30 minutes I started to feel a tingly, almost minty-like feeling and when the 90 minutes was over, I took the masks off and rinsed my feet. I noticed that the nail polish on my little toes and big toes had been affected by the foot mask. Those particular toes were in positions that they directly rubbed against the sides of the foot mask, so I think that’s why they were the only ones affected. The three middle toenails on each foot were perfectly fine. Also, that minty-like coolness continued probably until I went to bed that night (I first applied the masks at about 8 pm). 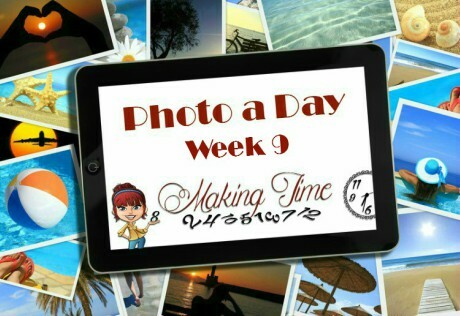 Day 3 rolled around and I was totally surprised. The masks actually work! The night of day 3, I took my socks off and looked at my feet and there were spots of loose skin just waiting to be peeled away. I peeled what I could (watch the video) and waited to see what else would happen over the next few days. This is everything I peeled off on Day 3! Day 4 came and, again, there was some additional peeling. Even the bottoms of my toes started to peel a little bit. In the video you’ll see I did a 7 day update just so you could see the progress that had been made before actually getting to day 10. The majority of the bottom of my feet had peeled and there were visible rigid lines all the way around the sole of my foot, where you could see at what point it peeled up to. The line stopped right at the top of the sole, all the way around. I figured that was as far as the peeling would go and that the top and sides of the foot wouldn’t do anything, but I later found out I was wrong. At this point I also had peeling on the front and tops of my toes, around my toenail. I mean the peeling literally went all the around my toenails and all the way up to the crease of my toenails. There was even peeling in between my toes. The only places that had yet to peel on the bottom were parts of the rougher, callused spots and also the inner sole. On day 8, it was warmer out so I decided to pull out my sandals. My feet needed some moisturizing, but I wanted so bad to wear them so I did. They were thong sandals that went between the toes and up across the top of my foot. When I got home and took my sandals off, I noticed that there was slight peeling across the tops of my feet. It was nothing like the large pieces that came off the bottom of my feet, but was peeling nonetheless. Finally day 10 arrived and I was amazed at how well these foot masks had worked. Those rough spots that hadn’t yet peeled a few days ago, had peeled at this point. My heel looked amazing and wasn’t at all dry and cracked in the creases. The rougher, callused spots still felt a little rough, but they did peel and were visibly better. Just what I need for sandal wearing! This also means that the foot masks delivered exactly what they said they would. By day 10 the calluses are supposed to be all gone and as of day 10, all of mine had peeled. 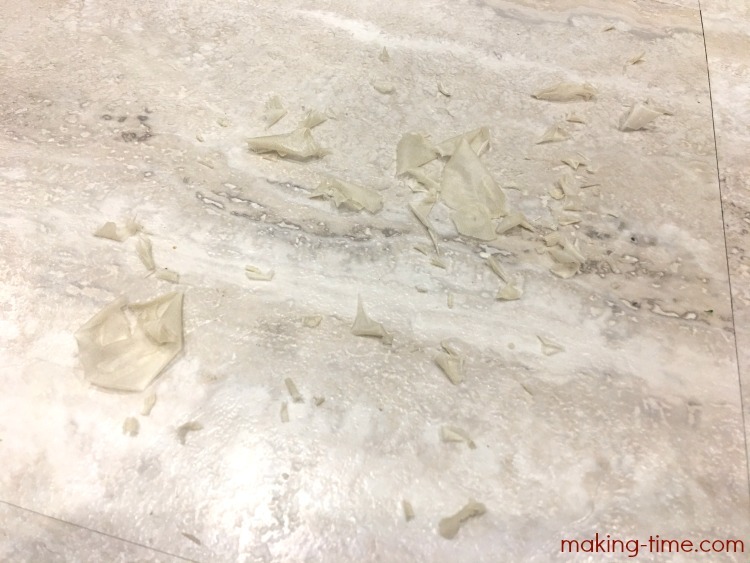 The tops of my toes had also started peeling down to the base of the toes and the inner sole that hadn’t peeled yet was very dry and peeled off in small strips. As a little added bonus, after taking a shower the night of day 12 I noticed the tops and sides of my feet were peeling. Again, not in large pieces like the bottoms of my feet did, but with some rough rubbing, the skin kind of rolled off. This picture doesn’t even do justice, but you can see that the dry, flaky skin from the “before” picture is now gone. You definitely want to watch the video! Ready to get your feet sandal ready? Head over to Amazon and get your order in now! When I ordered, the pack of three was just $10.99 and today the pack appears to be $11.99, so know that prices on Amazon change all the time. There are a few different scents that Purederm offers, too. I assume since they’re the same brand, and have the same purpose, they’ll all work the same. Also, order when you seem them! They are currently out of stock and every single time I go back to check, it’s the same thing. It just so happens that when I ordered back in February they were out of stock at that time too, but lucky would be restocked in just a few days. As soon as that date came, I believe it was the next day that my order was shipped. *This post contains affiliate links, in which I may receive compensation for your purchase. My opinions are 100% my own and in no way influenced by the brand. Any claims or statistics should be confirmed with the brand. Please see this blog’s full policies and disclosure here. Thanks for that great video. My only problem was that the music was so loud I had to turn down the sound and then turn it back up when you started speaking. Thank you for the feedback. I’m still learning my way around video creation and editing. Can I ask if you were watching on mobile or desktop? Everything seemed fine when I played it back on my desktop. Regardless, I’ll keep this in mind moving forward and adjust the interim volume. Thanks! Omgosh that’s CRAZY!! How awesome!! Ordering one right away!! My feet need to get summer ready!! Thank you for your test on this item. I’m actually having issues right now with my big toe peeling because I’m in the pool alot(just moved from Chicago to Phoenix so of course I’m swimming a TON) thanks again! Hi! May i ask you something? How many times do you use that product? I mean in a month? Because i have 3 purederm foot masks here, so i have no idea when i will use the 3. I used the 3 of mine over a year, so about every 4 months or so. You could probably do it more often or even less often. I could manage with doing it twice a year if I wanted. 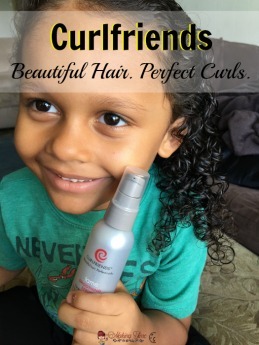 i brought this product thru a friend, was really amazing seeing the results. My husbands feet becomes soft and less dry unlike before. Though needs more mask to continue the peeling in some other areas. I really recommend it to those person having hard calluses. 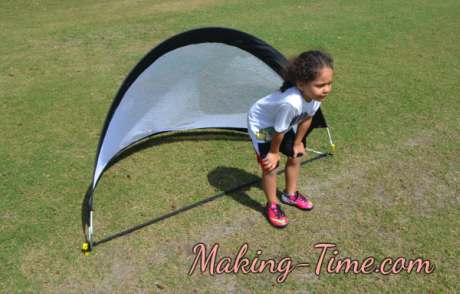 Even it takes time but it worthed. Will be using the 2nd pair and will see how the result more. I was just sitting here the other day thinking it’s time for me to do another foot mask. I’ve already used the 3 that came in my first order, so I’ve got to get some more. They really do work, though. I’m glad your husband had good results! I’ve been trying to convince mine to give them a try.